Depending on which country we travel to, we have a different To-Do List. Some of the items remain the same (getting vaccinations, budgeting for the trip, buying travel gear, etc. ), but for this particular trip, which will take us through Mongolia, Russia, Central Asia & Iran, there is so much more that needs to be planned, dealt with and thought about. We can’t seem to find much, if any, current information for backpacking through this part of the world, so we’re going to put together all kinds of information for future travellers! Where in the world should we go? Planning a trip is always fun! 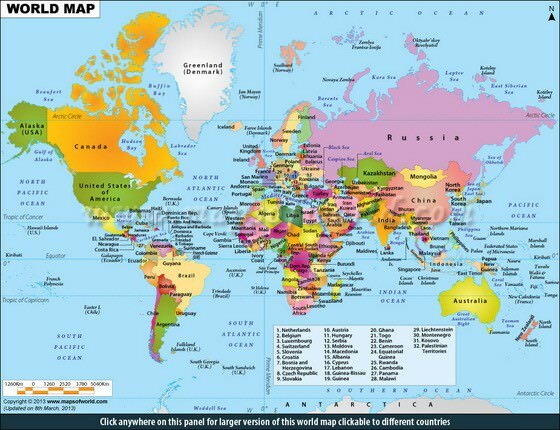 We’ve had to think about which country to start in, where the weather will be the best for the activities we want to do and if we can enter by land, or by air. We’ve come up with this route that works out well for trekking, camping, fishing and wandering around temples and markets. China → Mongolia → Russia → Kazakhstan → Kyrgyzstan → Tajikistan → Uzbekistan → Turkmenistan (if our visa application is approved) → Iran → Turkey (?). We haven’t quite decided where to go after Iran. Planning the route and figuring out where to go is the fun part! 2. Get Passport Photos Taken. All of these countries (except for Kyrgyzstan) require a visa to enter their country. We will need to send 2 passport photos with our documents when we apply for our visas. The size must be 3.5cm x 4.5cm. (You can get a visa on arrival for Turkey and don’t need to provide photos). Make sure to get passport photos! 3. Contact The Embassies & Arrange Visas. For us living in China, the closest embassies are in Shanghai. We are going there this Monday to drop off our passports at the Mongolian embassy. We will then have to return to Shanghai about a month after to apply for our Russian and Kazakhstan visas. 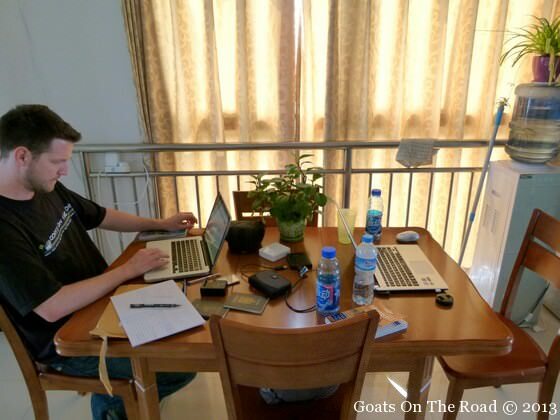 Goats On The Road travel headquarters! 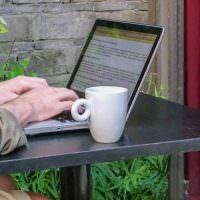 Researching, Skyping, writing…and keeping hydrated! We are in contact with Key2Persia regarding our visa for Iran. This visa process takes quite a long time. If/when we are approved for the visa, the agency will email us a “code” and we will pick up our Iranian visa en route at the pre-determined embassy. 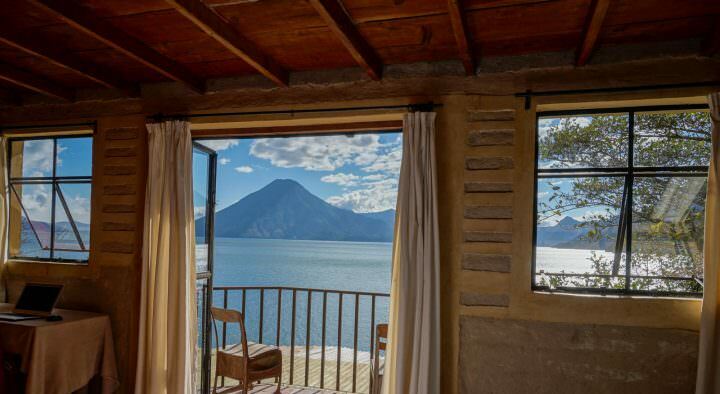 This is the difficult part, figuring out which is the best country to pick up this visa…we definitely need to plan ahead and schedule to be there on time! The other visas will have to be obtained while we’re on the trip. 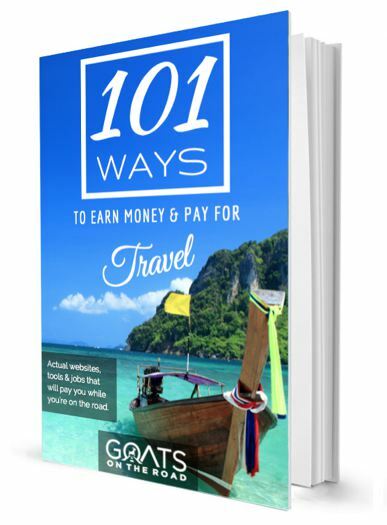 (Once we have all of our visas, we will be preparing a Visa Page on our website for all of these countries, including costs and where you can and can’t get visas while on the road). Kyrgyzstan is the only country that doesn’t require a visa. 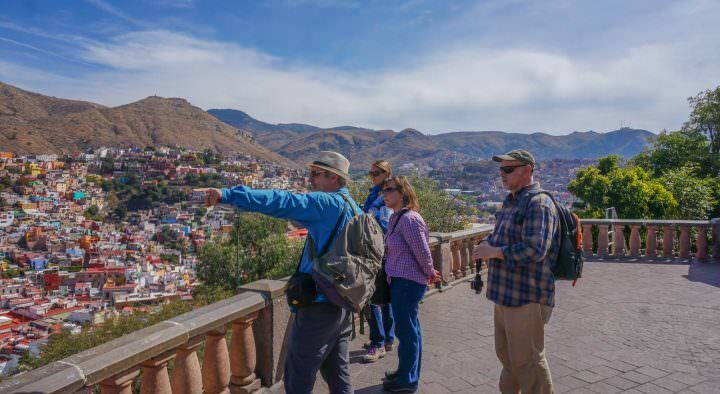 All of the other countries require one, and if you’re entering by land, they must be obtained ahead of time (you can get the Turkey visa at the border). Make sure to contact the embassies of the countries you wish to travel to beforehand to figure out what you will need to send them. Some visas can take weeks to be approved, give yourself lots of time. ***Keep in mind a visa is only valid for 3 months once you’ve received it in your passport…so don’t apply for your visa in June if you plan to travel in October. Since we’re living in China, we will enter Mongolia by land. We’re going to take the Trans-Mongolian train. This ticket needs to be booked in advance. We’re booking through CITS agency in Beijing, who have been extremely helpful. In order to get a Russian visa, we will need to have proof of transportation in and out of the country and accommodation while we’re in Russia. We are working with Real Russia to figure out which trains we want to book in and out of the country. 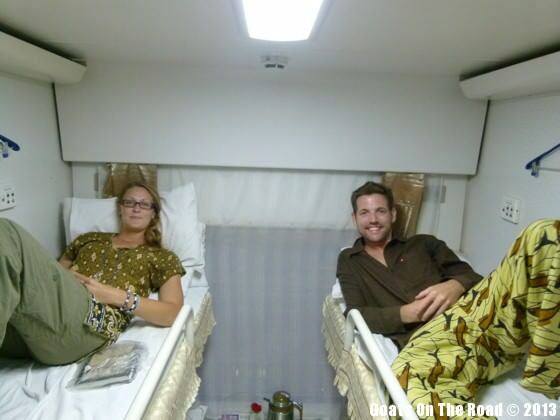 We’ll most likely be on the Trans-Siberian train…which is exciting! For us, flying around Central Asia is just too expensive…and the safety records of the airlines in this area aren’t too comforting! We’ll be travelling by land, which we prefer anyways. Whether you’re entering by land or by air, you will need to book your tickets. Check out FareCompare.com for flight deals. Keep in mind that if you enter Uzbekistan by air, you should be able to obtain a visa on arrival at the airport. However, you will need to have a Letter Of Invitation to show to the immigration officials when you arrive. This Invitation Letter can be obtained for about $35 through Stan Tours. If you enter Tajikistan by air, you are able to obtain a 30 day visa on arrival without the Letter Of Invitation. We don’t like to reserve our rooms really far in advance, but in order to get the Russia visa, we will need to have hotels/hostels booked for our stay in Russia. 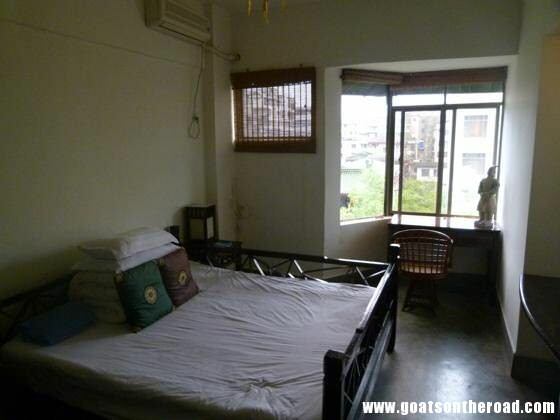 We are going to book rooms through HostelWorld.com and Booking.com. These countries don’t have ATM machines that will allow for the use of our bank’s debit card. It’s ok to use a credit card in the machines, but not a bank card (or so we’ve read, we’ll update this when we’re on the ground). We have a MasterCard and have just applied for a Visa credit card. 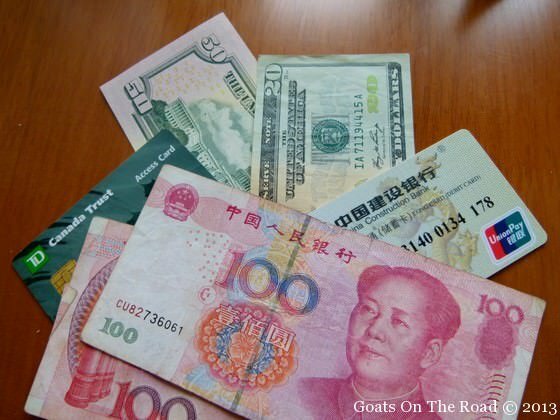 We will also have $3,000 USD which we can use to exchange for the local currency, which we’ll have to order ahead of time at the bank here in China. In Iran, our credit cards and debit cards will be useless. We need to bring in a sufficient amount of USD and Euros to cover our stay here. This part of the world is great for trekking, camping and fishing. 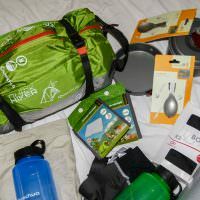 We’ve bought (or are in the process of buying) a lightweight tent, sleeping bags, sleeping mats, trekking poles, fly-fishing rod, lightweight pot, plates and cutlery. We already have our backpacks, the clothing we need, our first-aid kit and our electronics. We’ll put together a full list of what to pack for a trip like this once we have all of our gear. Having travel insurance is definitely important. Especially for this part of the world and especially because we plan to do high-altitude activities, trekking, etc. We’ve always booked through WorldNomads Insurance. They have great prices, coverage and the best part is you can alter your insurance online while you’re on the road – it’s really easy. 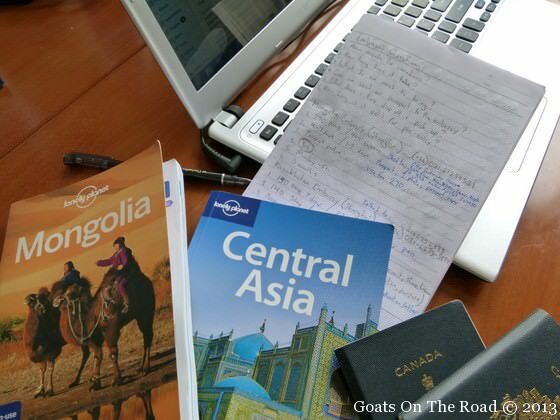 Planning a trip through this part of the world requires quite a bit more planning than going to SE Asia! 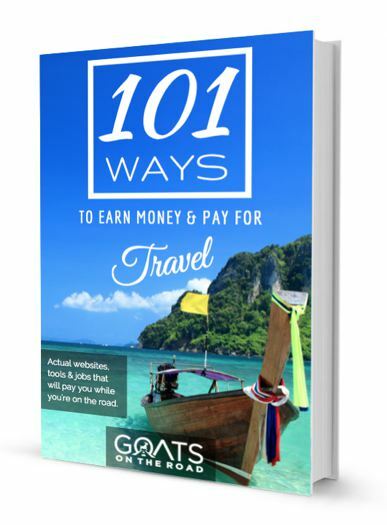 The biggest issue is getting the visas ahead of time and figuring out where we can get the rest while on the road. 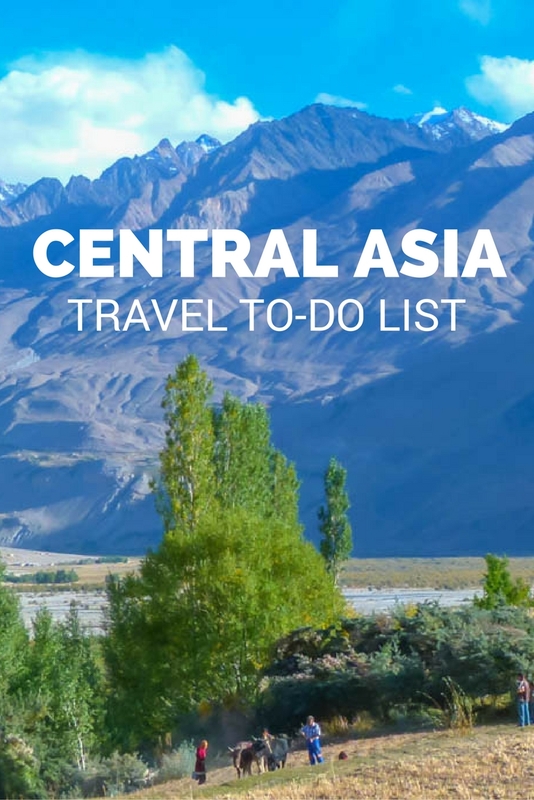 We’ll be updating all of this information when we’re actually out there and will have more details for future Central Asian travellers! Thru for u.Wish l was coming along to take care of u kids. I was in Turkey in February. I was a bit apprehensive but ended up loving it. Glad to hear you ended up loving Turkey. It’s one of our favourite countries! We were there in 2011 and are excited to (possibly) go back again. Great tips guys. 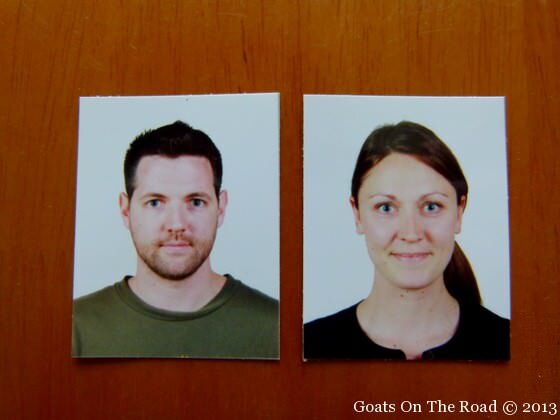 We always forget to take some passport photos with us and then locals try to rip us off. We need our passport photos every time we enter Hong Kong and apply for Chinese visas :). I know, we’ve also been ripped off at embassies…you end up having no other option but to pay the amount they want!